Despite a NASA spending freeze in the White House's new 2012 budget proposal, the space agency plans to prioritize commercial spaceflight in the hopes that American companies will soon be able to transport NASA astronauts to space. Under President Barack Obama's proposed spending plan for the next fiscal year, which was announced yesterday (Feb. 14), NASA would receive an annual budget of $18.7 billion – the same amount it was allocated in 2010. Given limited funding, the space agency has decided to prioritize the International Space Station (ISS), and the effort to stimulate private U.S. companies to build spacecraft capable of carrying crews there, NASA administrator Charles Bolden said at a press conference yesterday. 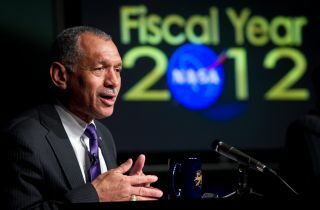 "It's difficult fiscal times and we had to make very difficult fiscal choices," Bolden said. "The centerpiece is ISS. If I want to sustain it and have it safe for crew, I need a way to get cargo and crews there as quickly and safely as possible. With that goal in mind, we changed the balance of funding to commercial crew and the vehicles themselves." Where most sectors of NASA would receive less funding than was recommended in the NASA Authorization Act Congress passed in October 2010, commercial spaceflight would receive more money under the new budget blueprint. The Obama administration budget request offers $850 million for development of private spacecraft, while the bill only stipulated $500 million for 2012. "With the extension of space station to at least 2020, making commercial crew successful is a high priority to close the gap," said Douglas Cooke, NASA's associate administrator for exploration systems. "The budget numbers have been increased to bring these on in a meaningful timeframe." Given those levels of funding, Cooke said he would hope commercial spacecraft would be online by 2014 to 2016. The White House's 2012 budget request must now be debated by Congress, which has the ultimate responsibility to pass a new budget. Some lawmakers have resisted NASA's recent commercial push, saying that privately built spacecraft can't be as safe or reliable as government vehicles. Bolden defended the commercial space industry, highlighting achievements such as the December 2010 test launch of Space Exploration Technology (SpaceX)'s Dragon spacecraft atop its Falcon 9 rocket. The capsule became the first commercial craft to launch to Earth orbit and re-enter successfully. "I defy anybody who says that American industry can't do what I have faith in them doing," Bolden said. Commercial space leaders applauded the move. "In this constrained fiscal environment, commercial spaceflight is more important than ever," Bretton Alexander, president of the industry group Commercial Spaceflight Federation, said in a statement. "NASA's Commercial Crew program will result in significant savings to the U.S. taxpayer, and will cut the amount of money the nation has been sending to Russia every year. Leveraging private investment is the only way NASA can make its dollars go farther in these times of belt-tightening." Other elements of NASA's portfolio would take a hit under the new budget proposal, including a plan to develop a heavy-lift rocket capable of carrying humans to the moon, asteroids and Mars. The 2012 budget request offers $1.8 billion for a heavy-lift booster, and $1 billion for a crew capsule to ride atop it. In comparison, last year's authorization bill sought $2.6 billion for the rocket and $1.4 billion for the capsule. NASA officials acknowledged that these cuts could delay the process of building such a vehicle, and declined to say whether or not they would be able to complete the heavy lift rocket by 2016 as stipulated in the NASA Authorization Act. Bolden said the booster would be "evolvable" and later versions would build on initial precursor models. "It doesn't start out as the biggest rocket known to man," Bolden said. Other NASA projects would also receive funding hits under the new proposal — notably the agency's Earth science program, robotic precursor exploration missions intended to map out solar system destinations before astronauts visit and a plan to redesign NASA's Florida Kennedy Space Center as a "21st Century Launch Complex."